Over the past year, I’ve taken several beginner-level French language classes. In each one, the most common questions asked of my French teachers were not about the ins and outs of the language, but rather their favorite French restaurants in Chicago. So when my most recent French teacher, who hails from Cannes, answered with Bistro Voltaire, I resolved to dine there in the very near future. Situated in River North at 226 W Chicago Avenue, Bistro Voltaire has offered authentic French fare since 2011. 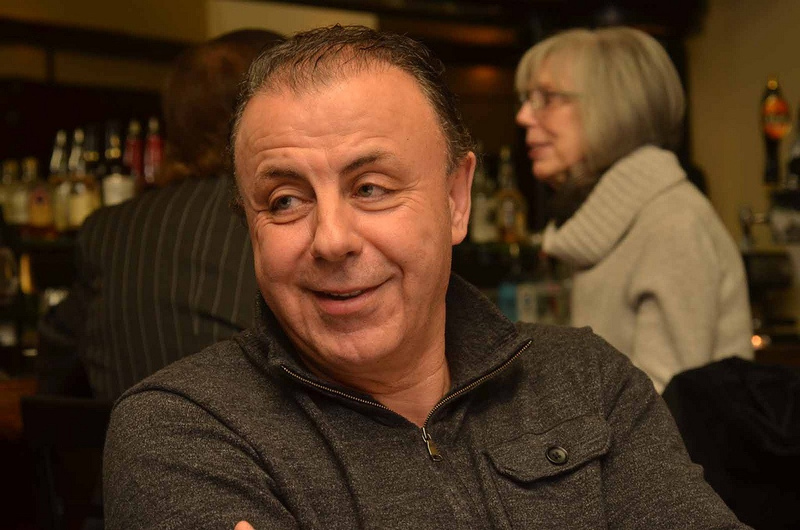 Ned Boukram, a French native, opened his bistro to offer Chicagoans a place to escape and experience joie de vivre – right in the heart of the city. 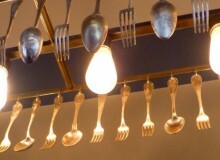 Bistro Voltaire offers reasonably priced, classic French food in a warm and inviting atmosphere. The seasonal menu offers popular dishes from all regions of France. The winter menu includes classical and regional French dishes such as soupe à l’oignon gratinée, escargots de bourgogne, gnocchi à la parisienne, mérou à la provençale, and boeuf bourguignon. You can complete your meal in decadent style with classic desserts such as tarte aux pommes normande, gâteau au chocolat, profiteroles and crème brûlée. Bistro Voltaire diners can also enjoy an extensive list of more than 50 French wines, all personally selected by Mr. Boukram. 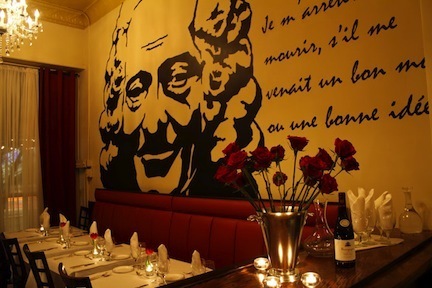 Upon entering the bistro, you can’t help but be drawn to the wall mural with a large etching of Voltaire and one of his most famous quotes: “Je m’arrêterais de mourir s’il me venait un bon mot ou une bonne idée.” (I would stop my death if a good word or good idea come to my mind). 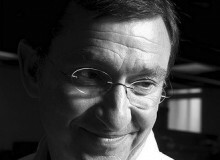 It is another way Mr. Boukram shows his pride of French food, arts and culture – and invites everyone to enjoy it all too. The bistro name and the mural are all a part of Mr. Boukram’s ode to Voltaire and other famous French philosophers and writers. At the bistro, you’ll often find guests fondly leafing through a book of their photos. When Bistro Voltaire first opened, most patrons were from France and Europe, or those who had traveled to France and wanted to retrace their culinary adventures at home. Today, as word has spread about the bistro, its customers now include an eclectic mix of people – all seeking to enjoy French comfort food and a certain joie de vivre. Single ladies take note: Bistro Voltaire bar attracts a group of single, French men most Friday nights. That’s just a little secret Mr. Boukram let me in on, and I’m happy to share it with you too. 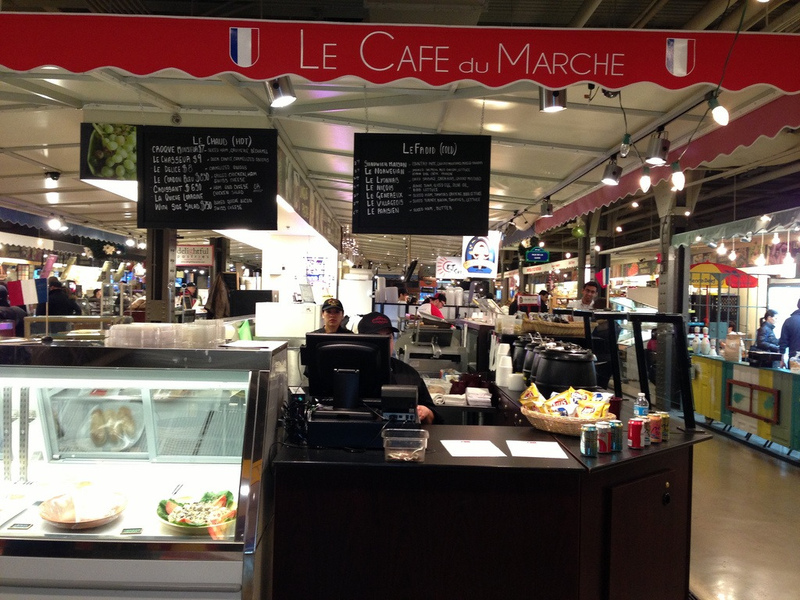 French foodies who live, work and play in Chicago’s West Loop, have celebrated the recent opening of Le Cafe du Marche at the Chicago French Market (131 N Clinton Street). The cafe from the team at Bistro Voltaire offers a selection of French soups, salads and sandwiches. 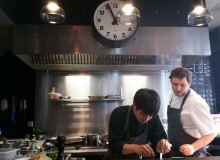 It’s just one more way you can savor French fare from Mr. Boukram and his team in Chicago. To this day, I am thankful to my French teacher for the wonderful suggestion. I truly did learn a lot in that class. Have you dined à la française at Bistro Voltaire or Le Cafe du Marche? 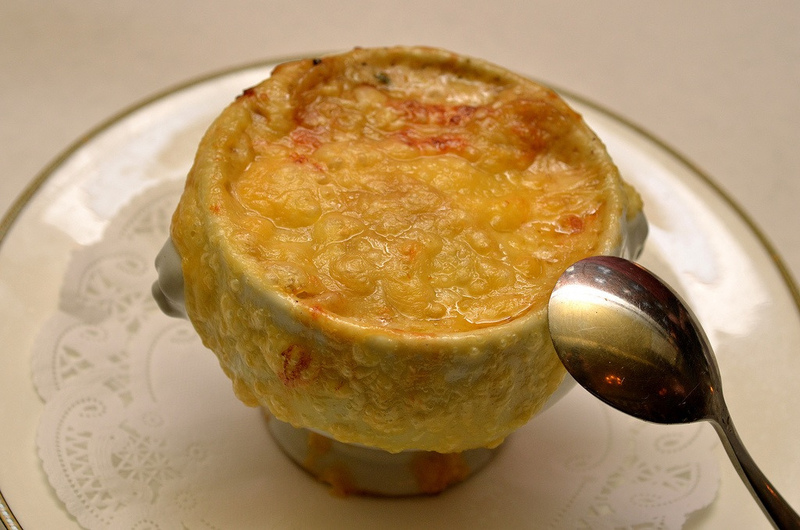 What is your favorite French dining establishment in Chicago? Share your thoughts in the comments below. I am an urban explorer and writer living in Chicago. 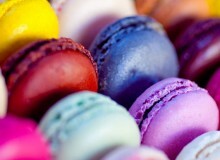 I am American - and a Francophile at heart. I love to discover new French restaurants, bakeries, markets and events in my hometown and beyond, and connect with others who do as well. Catch my latest thoughts on Twitter and my blog.